A savings bond must be reissued by the Treasury to change ownership. 2. Can a Co-Owner of a US Savings Bond Give the Bond to Another Co-Owner? 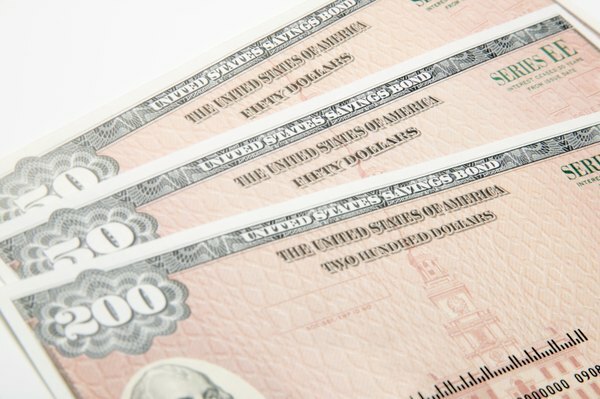 A U.S. savings bond will have the name of a single owner or two co-owners printed on the bond. Only a listed owner can cash in the savings bond. To change an owner on a savings bond, a reissue request must be sent in along with the bond to the U.S. Treasury. The Treasury provides detailed rules to make sure the process is completed correctly. Download or request by mail the Treasury form PDF 4000, titled Request to Reissue United States Savings Bonds from the Treasury Direct website. Savings bond forms can be found under the Forms tab listed at the top of every page on the website. From the page listing savings bond forms, you can either enter your address to have forms mailed or download a form in pdf format. Complete the pdf version of the form 4000 on your computer before printing it out. The form is "fillable," allowing you to enter the required information and print out a completed form. Do not sign the form after printing it. Take the completed, but unsigned, form 4000 to a bank or brokerage firm to have the signatures verified. The form must be signed in front of a bank officer and the signer's identification verified. The person whose name is being removed from the savings bond must sign the form. Mail the completed form 4000 and the savings bond to the Treasury at the address listed on the directions attached to the form 4000. The rules for Series EE savings bonds allow any owner or co-owner to transfer his ownership rights to another person. With a Series I savings bond and listed co-owners, one of the owners can be changed only in the event of death or divorce. Use a form PDF 1455 to change a savings bond's ownership to a court-appointed guardian or legal representative. Use form PDF 1851 to change ownership from an individual to a trust. Can I Cash a Savings Bond at a Bank if I Don't Have an Account There?